The last session of our liveblog coverage is on mobile advertising. First up is Dennis Glavin, @dennisglavin, of Microsoft Advertising. Consumer using a mobile device as a substitute for a PC: informational in nature. On-the-go queries: supplement desktop search volume, centered on local action and with greater commercial intent. On a PC, the query chains of a search can take up to a month. On a mobile, it can take an hour. The mobile searcher is further into the funnel. 37% of consumers reported leveraging mobile to look for ore info after seeing a product advertised on an outdoor, newspaper or radio ad. With TV, it’s 40%. Consumers are responding to other formats of media and going to mobile to search for more info. Have a strong, mobile specific call to action. Have the landing page that’s light and formatted for mobile. Macy’s is an example of mobile well done. They own the Macy’s brand on mobile. They have the mix of category, root and secondary brand keywords so they’re second for these second brand keywords. Ad copy has a strong call to action that builds on brand strength and mentions special offers. Deep link from secondary bands to search on Macy’s mobile site. The landing page is simple and light yet reinforces the bran. It’s formatted for smart phones and has a store locator and special offer to drive foot traffic in store. Next is Bill Dinan (@telmetrics). Mobile advertising has been adopted by SMBs faster than any other media induing ale in the 80s and Internet in the 90s. 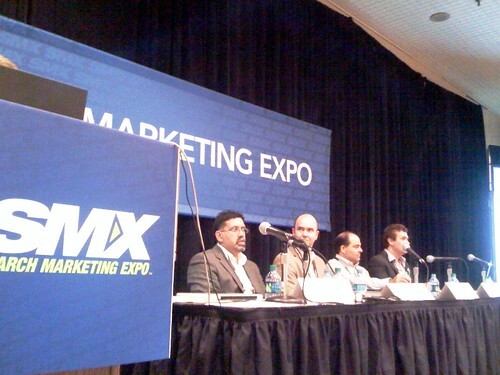 80% of SMBs plan to use mobile advertising in 2012. SMBs understand mobile because they use a smart phone every day and understand its value in their lives as consumers. They understand maps, QR codes, directional views, etc. There’s a strong increase in consumers using mobile devices to contact local businesses – nearly doubled in the last year. There’s an instant gratification in mobile, meaning these consumers are closer to the point of transaction than any other medium. Consumer experience impacts call durations. In a short amount of time, social affects mobile and shorter calls are a result of increased social engagement. Craig Hagopian (@xADinc) is up next. 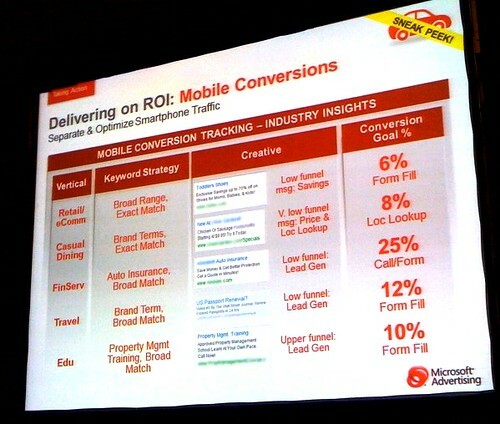 Mobile is about intent. Consumers are increasingly using local directory sites and local content apps to get immediate access to the info they need now. There’s been a combined 21% increase in local and mobile search since Q3 2010. A LoMo search request always has a what-where experience. The result of this is a landing page. 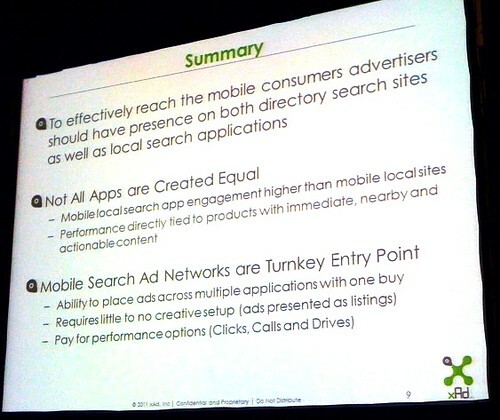 Unlike in search where there are a number of resulting advertisers, in a mobile app, there’s probably only one or two. Engagement cannot be measured solely on the initial click. In mobile often times what happens post-click is what’s most important. Secondary actions (SAR) include: calls, directions, more info, share, save, etc. Browser vs. In-App Search Ads: Generally, CTR is higher in a mobile app than on the Web. It’s usually the quality of the experience of the app that makes the difference, as the content is the same. It’s a behavioral characteristic difference – not simply apps good, browser bad. Barnaby Pierce from Google rounds out the panel. He’s the head of mobile search across a number of verticals at Google. He’ll focus on top 10 best practice tips to drive conversions on Google through mobile. One in 7 queries in Google come from a mobile device. By the end of the year, 26% of hotel queries will come from mobile devices. Thirty-six percent of pregnancy queries will come from mobile by the end of the year – so it’s even in unexpected categories. These searches are incremental and supplement desktop activity. Understand your mobile traffic. Use Web analytics to find out what people want while on the go. Understand which devices and carriers are visiting your site, keywords consumers are using, and track mobile independently. Manage your customer’s mobile experience with an optimized mobile site. This is the most important in his opinion. Mobile users hold grudges. Google’s mobile landing page builder is free – there’s no excuse. Sixty-one percent of users say thy won’t turn to a site without a mobile version. Think separate mobile campaigns. Average mobile CTR increases 11.5% It allows more control, better budgeting and bidding, and creative for mobile. Use mobile specific creative. 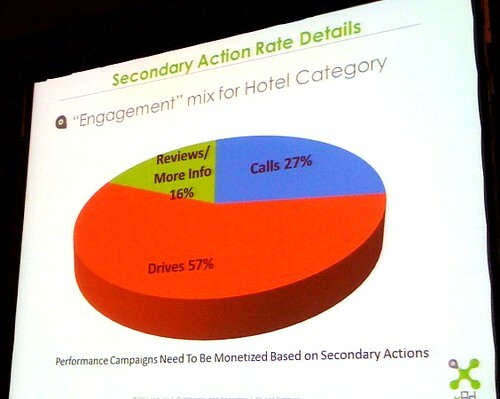 Improve CTR by incorporate a mobile call to action in ad copy. Think local. When consumers find local action they act on it. Think immediate. 70% of smart phone users use hone while shopping in store. 82% of bookings on a mobile happen within a day, vs. 45% on desktop. Manage to position 1-2 and defend your brand territory. In Germany, 85% of time spent on mobile SERP spent on top two ads. CTR drops 90% between Position One and Four. Drive leads with click to call. They produce great results – 6-8% average increase CTR. Improved CPA of 20% to 30% less cost than other marketing channels. Qualify your customer. Thirty percent increase in CR with mobile sitelinks. More options, drive deeper into site, differentiate between customers to drive to most appropriate landing page. Separate tablets from your mobile strategy pull tablet specific reports to monitor performance. Tablet device behavior is more in line with desktop than smart phone. In AdWords you can pull tablet specific reports. Find out if there’s a difference between tablets and desktop performance, allowing you to see if you should pull out tablets.